I come to work every day to a safe and clean shop. We have some of the latest technology, and I feel that I have the tools and resources needed to do my job to the best of my ability. The training at Schneider is excellent. We have processes in place to help new technicians know what is expected of them and what they need to do to be able to succeed and excel in their roles. Pay is not everything in a job, but it is very important. I want to work for a company that values my contributions and compensates me with a wage that is both fair and competitive with other companies in the market. Schneider does the research to ensure that the pay they are offering is in line with other shops in the area. Schneider is a large company with many shops and operating centers across the U.S. and Canada. They also have a strong promote from within culture. What this means for its associates is that there are limitless opportunities to expand and grow your career. 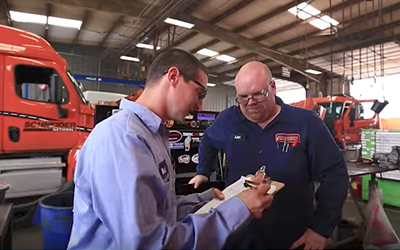 There are hundreds of stories of diesel technicians who have been promoted and who have continued to develop their skills. The opportunities are here if you take advantage of them. The core values at Schneider are ones that I can definitely align with: Safety, Integrity, Respect and Excellence. These aren’t just words on a wall — it’s the way we run our shops and the way we conduct business. I enjoy working for a company whose beliefs are ones that I can stand behind with pride. Still looking for more reasons why to join Schneider? At Schneider, we value our mechanics, both inside and outside the shop. See how we put our associates first. Lyndon is a Diesel Technician for Schneider. He works at the Reserve Operating Center and has been with the company since 2014 when he started as a Tank Washer. He attended South Eastern Louisiana University as well as the University of Houston. In his free time, he likes to work on motorcycles, ride ATVs and take care of his horse. Schneider opening new facility in Phoenix, Ariz.